Wieser, I., Toprak, S., Grenzing, A., Hinz, T., Auddy, S., Karaoğuz, E.C., Chandran, A., Remmels, M., El Shinawi, A., Josifovski, J., Vankadara, L.C., Ul Wahab, F., Bahnemiri, A.M., Sahu, D., Heinrich, S., Navarro-Guerrero, N., Strahl, S., Twiefel, J., Wermter, S. A Robotic Home Assistant with Memory Aid Functionality. Joint German/Austrian Conference on Artificial Intelligence (Künstliche Intelligenz), pp. 102-115, Klagenfurt, Austria, 2016. Twiefel, J., Hinaut, X., Borghetti, M., Strahl, E., Wermter, S. Using Natural Language Feedback in a Neuro-inspired Integrated Multimodal Robotic Architecture. Proceedings of the 25th IEEE International Symposium on Robot and Human Interactive Communication (RO-MAN), pp. 52-57, New York City, USA, 2016. Wieser, I., Toprak, S., Grenzing, A., Hinz, T., Auddy, S., Karaoğuz, E.C., Chandran, A., Remmels, M., El Shinawi, A., Josifovski, J., Vankadara, L.C., Ul Wahab, F., Bahnemiri, A.M., Sahu, D., Heinrich, S., Navarro-Guerrero, N., Strahl, S., Twiefel, J., Wermter, S. A Robotic Home Assistant with Memory Aid Functionality (video). Proceedings of the 25th IEEE International Symposium on Robot and Human Interactive Communication (RO- MAN), pp. 369, New York City, USA, 2016. 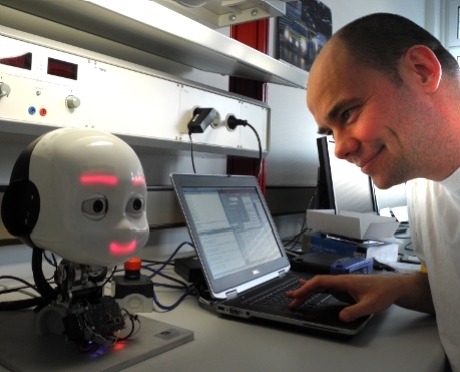 Barros, P., Strahl, E., Wermter, S. The iCub Chronicles - Attention to Emotions! , Proceedings of the 10th AAAI Video Competition at the Conference on Artificial Intelligence (AAAI-16) , Phoenix, USA, 2016. Parisi, G.I., Bauer, J., Strahl, E., and Wermter, S. A Multi-modal Approach for Assistive Humanoid Robots. IEEE/RSJ International Conference on Intelligent Robots and Systems (IROS), Workshop on Multimodal Semantics for Robotics Systems, Hamburg, Germany, 2015. 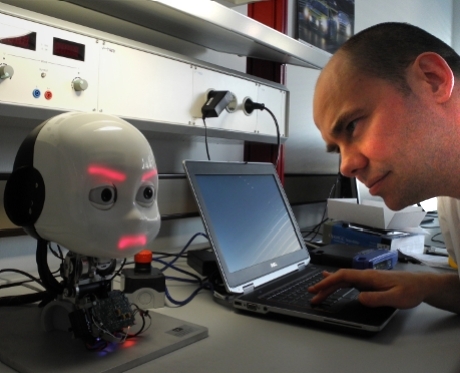 Parisi, G. I., Strahl, E. , Wermter, S. Robust Fall Detection with an Assistive Humanoid Robot. 14th IEEE-RAS International Conference on Humanoid Robots (Humanoids), November, 2014. Parisi, G. I., Strahl, E. , Wermter, S. Häusliche Sturzerkennung mit einem mobilen Roboter, Presentation at the eHealth Conference, Hamburg, 2014. Heinrich, S., Folleher, P., Springstübe, P., Strahl, E., Twiefel, J., Weber, C., Wermter, S. Object Learning with Natural Language in a Distributed Intelligent System - A Case Study of Human-Robot Interaction. Proceedings of the IEEE First International Conference on Cognitive Systems and Information Processing (CSIP 2012), in press (Springer). Beijing, CN, December 2012. Bauer, J., Dávila-Chacón, J., Strahl, E., Wermter, S. Smoke and Mirrors - Virtual Realities for Sensor Fusion Experiments in Biomimetic Robotics. Proceedings of the 2012 IEEE International Conference on Multisensor Fusion and Information Integration (MFI 2012), pp. 114-119, Hamburg, GER, September 2012. IEEE.